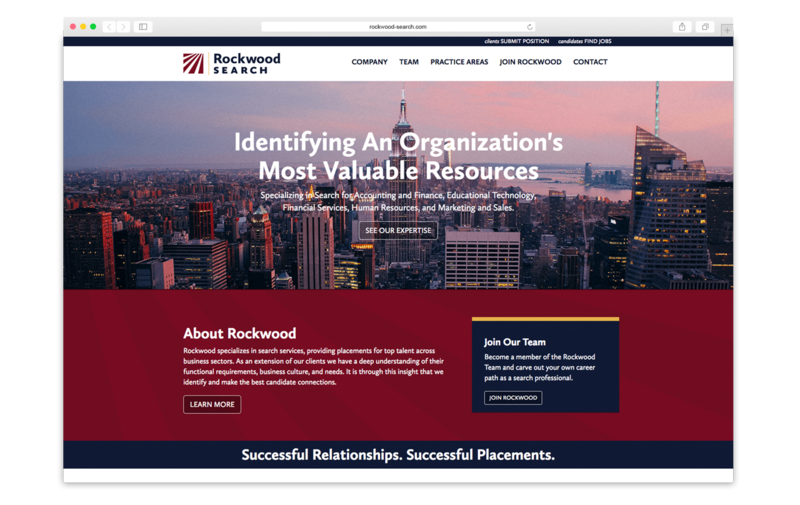 Located in New York City, Rockwood Search provides specialized job search and permanent placement services to high-quality candidates in the practice areas of accounting and finance, educational technology, financial services, human resources, marketing and sales, corporate services, and real estate. To improve the quality of connections between clients and candidates, Rockwood maintains its own online job portal. In 2015, Rockwood reached out to Springboard looking to update its website by making it more intuitive and mobile-friendly for visitors using smartphones and tablets. Because Manhattan is a hyper-competitive market for search and placement services, the company knew that its website needed to deliver an impactful first impression, not only to prospective customers and candidates, but also for its own recruiting efforts. Additionally, a revamp of its job portal was required to expand the number of practice areas offered as well as a more streamlined submission process to upload resumes and other candidate information. Rockwood requested to leverage WordPress for the website’s content management system. Concurrent to the website, Rockwood was in the process of updating its corporate branding that included a redesigned logo, letterhead and business cards. At the time, a few options from crowdsourced design services were considered, but none delivered the quality that Rockwood deserved. 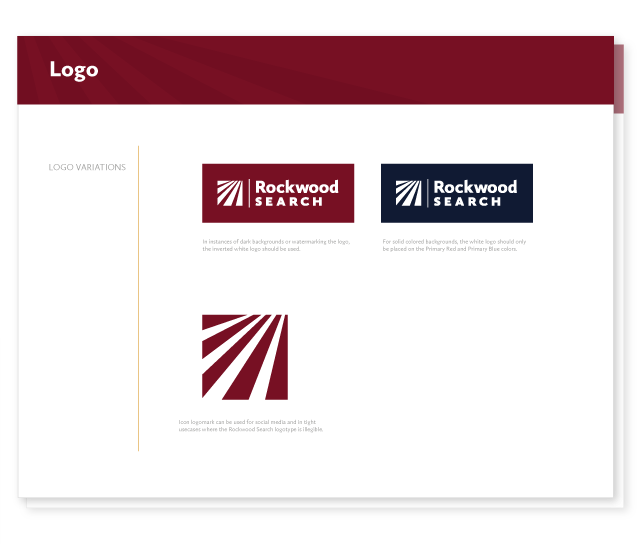 Unhappy with the crowdsourcing logo options, Rockwood expanded the original scope of work, giving Springboard the opportunity to offer new designs for the brand identity. As part of the process, a brand discovery session was administered followed by pencil sketches, typeface exploration, color combinations, and digital designs. 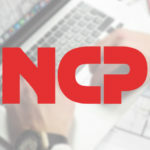 Once the logo was finalized, it was integrated into various marketing pieces, including new designs for business cards and a custom letterhead. 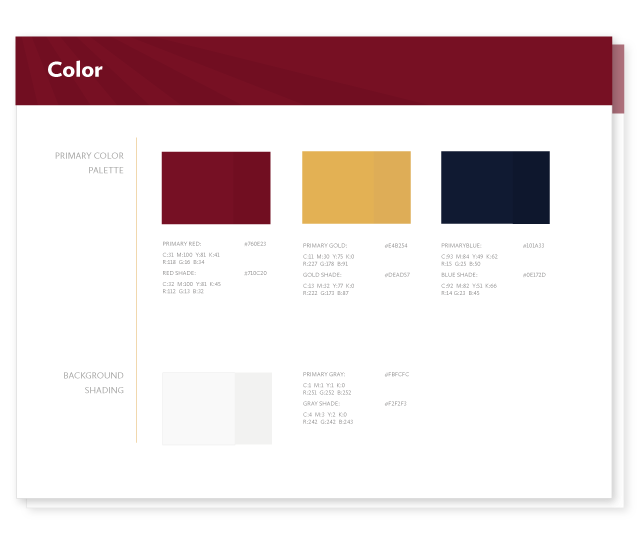 A style guide was also created to outline the typeface, colors, pattern, and proper logo usage. After locking down the new visual identity, a second discovery session was administered to inform the creative direction of wireframes, style tiles, and mood boards. Then, with each piece of the visual identity outlined, Springboard integrated the updated branding into a new website that uses responsive design techniques to optimize the viewing experience and usability on different screen sizes across multiple devices. Springboard also managed the migration of content and developed new copy where needed throughout the website. In addition to the visual design of the website, the functionality of the job board was completely redeveloped on WordPress to offer a seamless user experience within the website. On the backend, new controls were integrated to make job postings easy to publish and index. Within six weeks, Springboard delivered a new corporate identity and website that integrated responsive design, SEO best practices, and a user-friendly job board experience. As part of the design direction, Springboard built the website on WordPress to enable Rockwood to manage changes in-house. Springboard continues to provide ongoing site maintenance upon request. Rockwood has since expanded the website, adding new practice areas, visuals, and a team page that highlights key personnel.